There’s something dirty feeling about watching Michael Arrington’s interview of Microsoft CEO Steve Ballmer. I don’t mean that as criticism of Michael; plenty of other folks have done that all too well. It’s this new media thing, where you sleep with the people you write about. You do business with them and for them. Who am I to criticize? The new media thing is working out rather well for TechCrunch, which makes oodles of money, commands huge traffic and pageview numbers and mingles with Silicon Valley’s dealers and stealers. The pull is enough for Steve to sit down with Michael for a video interview. The CEO isn’t talking to the New York Times or Wall Street Journalhere, but to TechCrunch. The interview recognizes TechCrunch’s importance reaching the Silicon Valley elite, whom Steve had spoken to earlier in the day (Sept. 23, 2009). It also is yet another sign, among so many, how the news media is changing. There has been all kinds of rubbish talk and debate about the end of journalism. It ain’t happening, people. The old meda is becoming something else—it’s not going away. Blogs like Engadget, Gizmodo and TechCrunch are merely filling a reporting gap left open by the business and trade press, while applying newer technologies and providing better ways for readers to interact with writers. The old media’s real failure is engagement. In the late 1990s, as businesses prepared for Year 2000, I wrote a story on utility companies, which were preparing for Y2K and industry deregulation. Many of the utilities used customer-services systems that were 20-25 years old and provided no database fields for customer interaction. But deregulation meant they would have to compete by providing real customer service. Similarly, I see customer service in the form of reader interaction as being one of the important areas where the old media struggles to compete with the new media. Sure, many online news sites allow commenting, but they’re not necessarily building a community of readers. TechCrunch succeeds as a news gathering organization by providing readers what they want. The site has influence enough to snag Steve Ballmer for a video interview. Emphasis: Video. That’s new media, where broadcast and print intersect online. It’s way more interesting to watch Steve squirm than to read an edited Q&A printed in the Journal. The video is more unfiltered and reveals much through body language about his answers. TechCrunch writer Jason Kincaid noticed something new on Facebook. When viewing any photo, it showed a “Fax This Photo” link on the bottom right of the screen. Ridiculous? Yes. But everyone in the TechCrunch network saw it. He fired off an email to Facebook at 5:05 pm. When they didn’t respond, he posted at 5:29. Jason then called Facebook PR. Jaime Schopflin took the call and, apparently, couldn’t stop laughing for five minutes. Between laughs while catching her breath she mentioned something about this being a joke, that nobody but us could see it, and that they were placing bets around the office on how long before we noticed it and posted. And something else about teaching us to contact them before posting. In fairness, TechCrunch attempted to contact Facebook before posting. The outfit’s motto isn’t “post first, ask questions later” but more “post first, ask more questions later.” Being first is what journalism has always been about: Breaking the story. Just the incentives have changed. Online, the benefit is search placement, because how Google News favors early posters (or so says the SEO mythology). TechCrunch also updates posts when things are wrong, and there are plenty of blogs that don’t. It’s good journalism, but something more. Updating feeds the commenting, which also nurtures the community. Readers become part of the story, because of the process TechCrunch uses. The traditional media approach to reporting is this: Each story is a single entity—a complete body of reporting at time of publishing. The approach makes loads of sense for newspapers. TechCrunch practices more process journalism, which is closer to broadcast news. The story is ongoing, incomplete, that grows as more information unfolds. That kind of reporting is hard work, by the way, and extremely stressful. In some ways, the ethics debates are rather silly. High-and-mighty journalists balk about the corruption of their trade, of the end of impartial reporting. I have to laugh. American journalism history is all about conflict of interest and media moguls pushing agendas or slanted political views. There’s little difference from splashy tabloid headlines of last century and provocative search keyword-ladded headlines popping up on blogs today. One headline seeks to sell more print editions, the other to drive up pageviews. Conflict of interest is everywhere, and it’s unavoidable. Every blogger or journalist paid by pageviews has conflict of interest, which could also be claimed of any publication desperate to drive up circulation. Every Mac or iPhone-touting journalist who consistently writes glowingly about Apple has a conflict of interest. Apple is as much religion as brand. Conflict of interest is best managed through transparency, by writers disclosing whom they do business with or any mitigating relationships. Recently, I did paid consulting for a software company that I normally don’t write about. They’ve got a fabulous new product, which I might otherwise review. But because the company paid for my services, I haven’t yet written about the software. I’ll disclose the company should I ever write about the product. 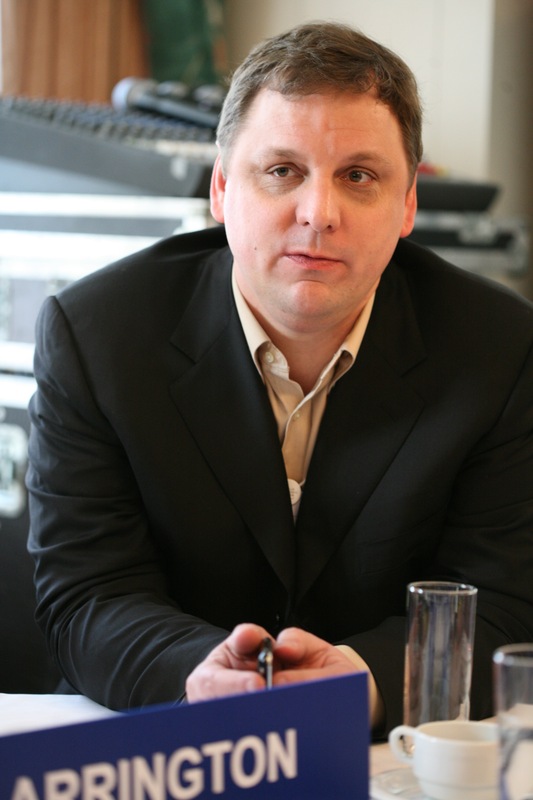 Conflict-of-interest claims will continue to dog Michael Arrington and TechCrunch for no other reason than its success. TechCrunch and other successful new media blogs threaten the old media status quo. Critics must go beyond so-called journalistic ethics concerns to look at the product and success. Today’s product is the Steve Ballmer interview, which is quite good. Michael does a much better interview than many seasoned journalists. I cringe while reading nearly every CNET News interview with Microsoft executives. The questions are nearly always softballs. The interviews are great PR for Microsoft, but really bad journalism. Michael’s interview style is friendly but deceptively probing. He is a lawyer, after all. I think of both men as being pitbulls of a kind, which makes the combination rather appropriate. Maybe it’s a lawyer thing, where power and position matter: Michael is clearly standing up and to the side. This has Steve looking up and away from the camera for the whole interview. I must admit that it puts Steve in an inferior position, which could benefit the questioner. I’m not looking to be a TechCrunch apologist here. But that blog and others like it are rapidly becoming the model for new media success. Yes, there is something dirty about the business model, but that should change as new media matures. More importantly, the business is dirty work. Scoops don’t just fall into reporters’ laps, although success and prominence makes them easier to get. TechCrunch does more original reporting than most blogs. It’s a dirty business, but that’s not all bad a thing. C`mon, Michael, talk dirty to me. Another interesting aspect to the new media thing is that you — or I, or anyone — can publish the TechCrunch video on our own blogs. We may not be in the video talking to Stevie, but we, too, can publish an original interview with him.